It’s 5am in Hong Kong, and I am wide awake. I’ve just returned from my annual November business trip to London, and it is about 8pm there, so naturally, I am thinking about … food! 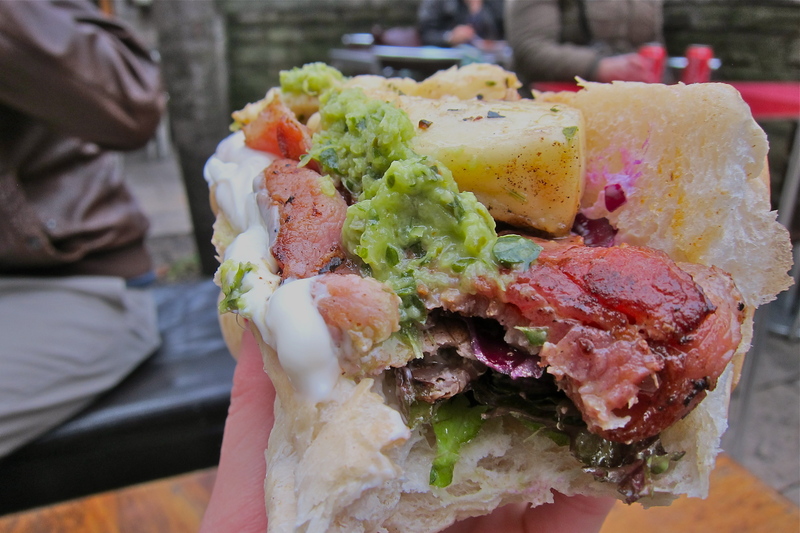 My most memorable food experience this time is definitely London’s Borough Market, it was an amazing foodie adventure that I would recommend to anyone visiting London. 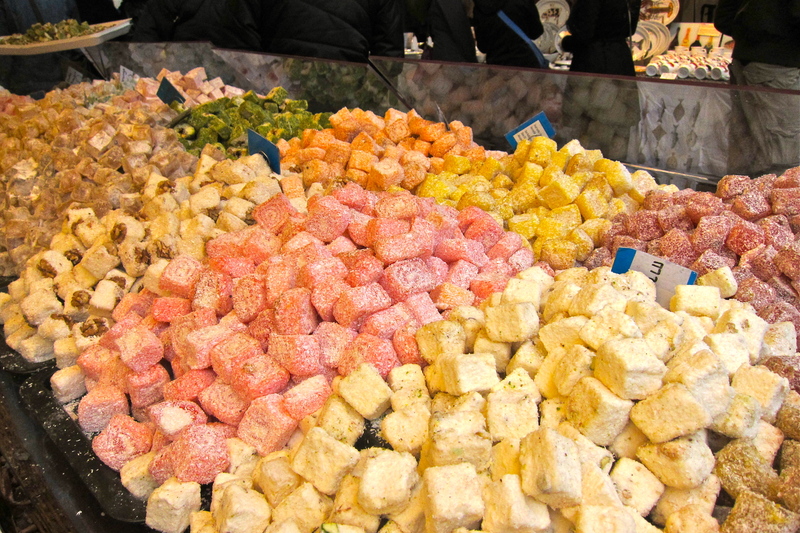 Whilst a trip to the market may not sound like the most exciting thing that one can do in London, you will most definitely be pleasantly surprised. 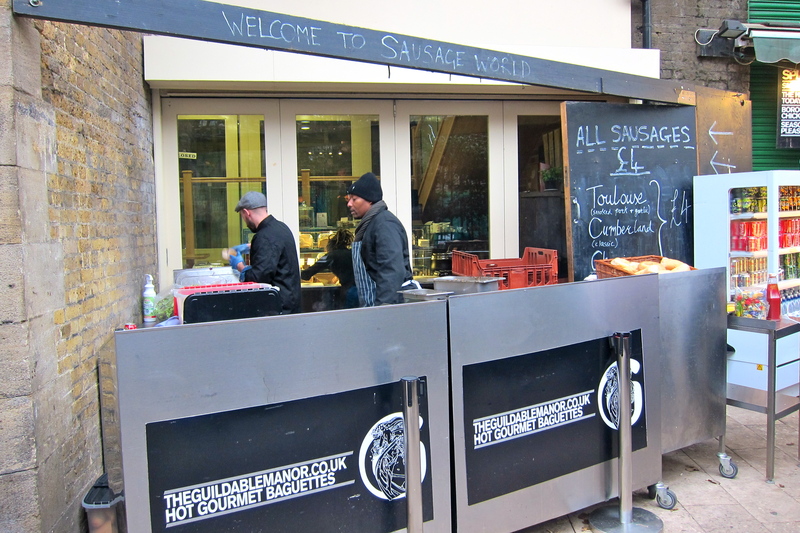 I don’t know why it took me so long to visit Borough Market, I have heard about it time and time again, and it’s unlike me to be lazy about this sort of thing. It was only after my friend SN said that she visited during her recent trip to London (her first time!) that I mobilised the troops (me and my brother) to visit on a Friday morning, when all of the stalls are open and the market is teeming with edible temptations. So thank you SN for the inspiration! Part of the market is located directly under the Borough High Street railway bridge, which was completed in 2011 but won’t have any trains running across it until 2016. We hopped on the Tube and went all the way down to London Bridge station, towards the south east on the Jubilee Line. The market is close to the station and really quite easy to locate – just look for the huge railway bridge! 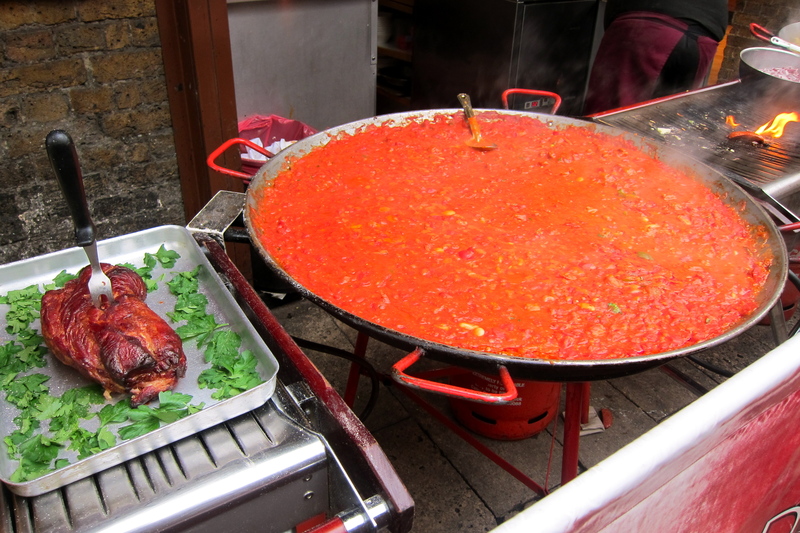 Upon entering the market, the first thing we were greeted by was a HUGE pan of simmering red sauce, next to an equally huge pan of paella. This is Café Brood, one of the bigger cafés which has lots of indoor and outdoor seating. Eyes wide open and stomachs growling, we went in search for our lunch. It is quite a dilemma to have so many choices with limited-sized stomachs! Whilst there are a few nice cafes and restaurants around, it’s much more fun to get something from a stall and eat it sitting on a park bench, and then go in search for more. 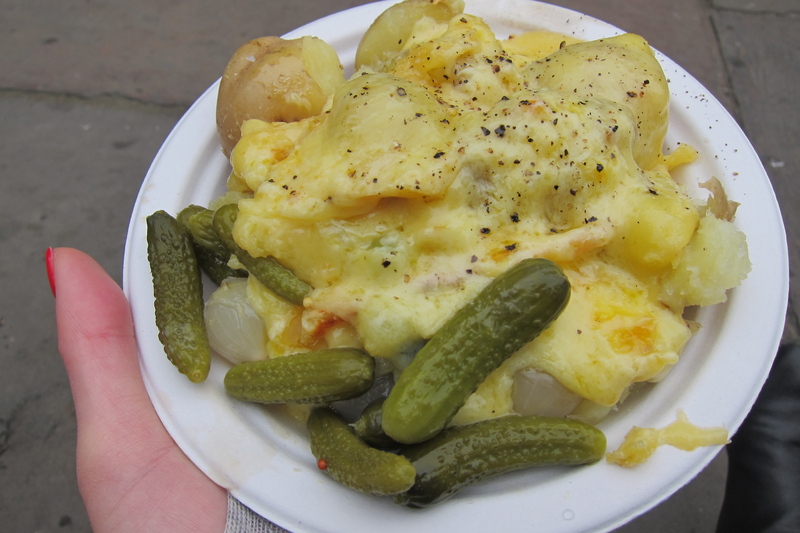 Whilst we were walking around, I spotted a lady walking by with a plate of new potatoes and cornichons (mini pickles) covered in a glorious amount of melted cheese – RACLETTE!!! “Follow that plate!”, I said to my brother! 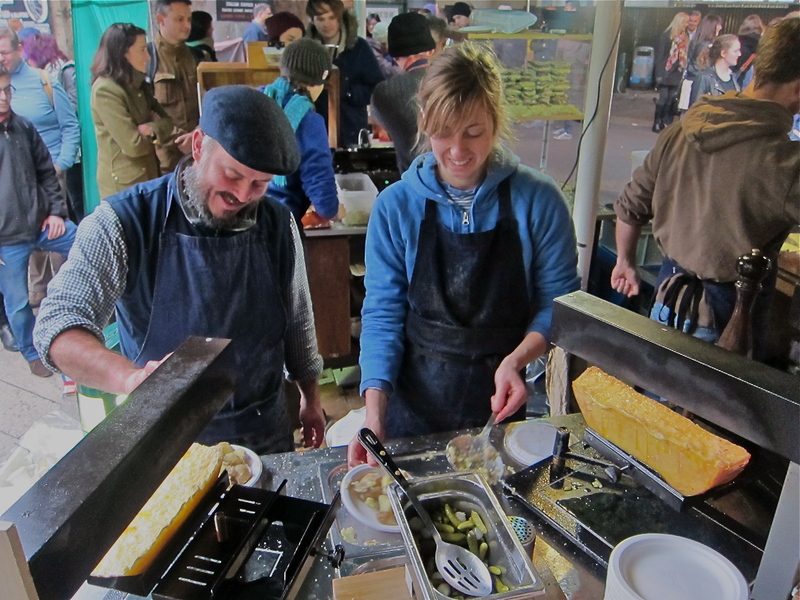 We found the raclette stall and joined the line of fellow hungry people. The wait passed quickly, as we watched the raclette-makers swing the cheese holder around and out to expose the bubbling half-moon of cheese. As they deftly lifted the huge block of cheese and scraped the top layer onto a plate of tender new potatoes, there were a lot of “oooooooooh”s and “aaaaaaaah”s – and all the tourists (including us) scrambled to take out our cameras to catch the next scraping. They look so happy, making raclette! 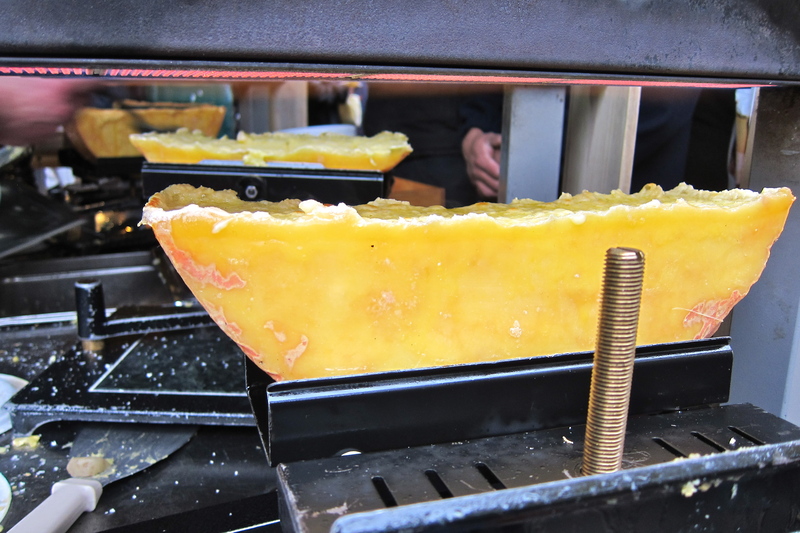 It was the first time I had tried proper raclette, apart from the small do-it-at-home kits. It’s the usual fare for après-ski, and as I’m scared sh*tless of skiing, it would be the only way someone could convince me to go on a ski trip. We sat on a curb in the park, as all of the benches were taken. Both of us managed to drop melted cheese or cornichons on our pants, leaving grease marks – but we didn’t care. My brother was convinced that his grease mark was shaped like a smiley face 🙂 Even his pants were happy to have raclette! After that we went back to the charming boys at the Guildable Manor for a truly awesome sandwich. The guys grill up all of the fillings right there and then, while chatting up the girls in the queue and bantering with each other – very entertaining! I ordered their version of the Club Sandwich – a generous helping of grilled haloumi, super-tasty back bacon bacon and (I opted to go for it without) huge chunks of grilled chicken breast in a soft bap, with a selection of tasty sauces. 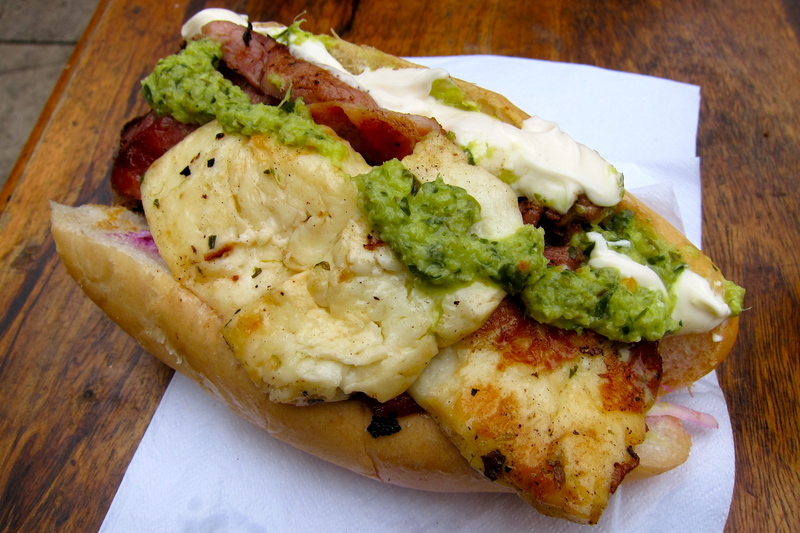 It was a truly superb sandwich, I would go back to the market just for one of them! We went back to Café Brood and ordered two of their apple ciders so we could sit at one of their tables. At £4 it was a bit pricey, but it certainly hit the spot on that cold November day. My brother opted to have a hot dog from Sausage World (Love the name – I know a few people who could crack a hilarious joke or two about it!) – run by the same guys who do the sandwich stall, but apparently no where near as good. I suppose that should have been self-evident from the fact that it was one of the few places without a huge line in front of it. After this we decided to do a spot of shopping. There were so many products with a quality and taste that are just so hard to find in Hong Kong, and you’ll pay through the teeth for them. I wanted to buy a small selection of these products (bearing in mind the limitations of airline weight restrictions), to savour at home and share with friends. 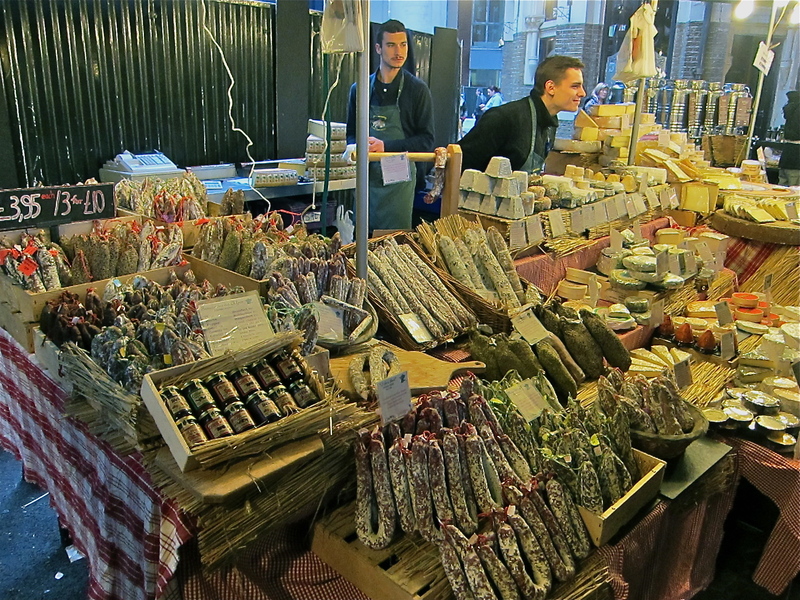 Our first stop was Une Normande a Londres, a cheese and saucisson stall run by two French brothers. 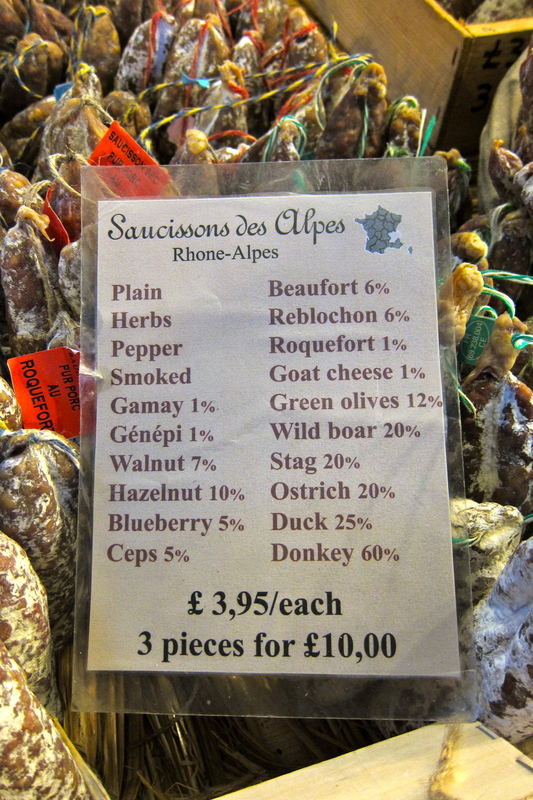 They had a great selection of sausages (Blueberry saucisson sec, anyone? 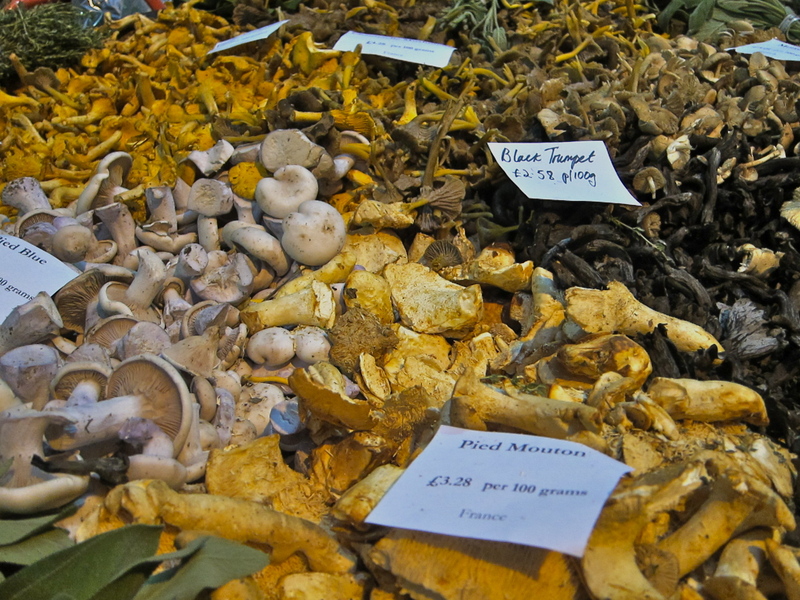 ), and I bought 3 for £10 – plain, ceps, and genepi). PB was very happy to receive them when I got home last night! You could try some of the cheeses with bread from the Bread Ahead Bakery, which offers a great selection of freshly baked breads, including this monstrously huge loaf (can you even call it a loaf at this size?!) 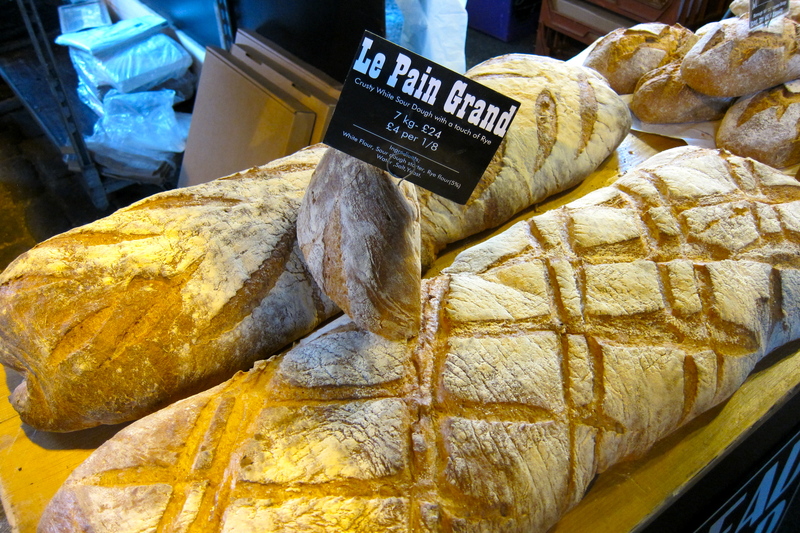 of bread, aptly called “le pain grand” (the big bread). You see those smaller loaves to the right – those are normal sized loaves! Whilst it looked quite grand, I wasn’t going to buy any of it after I saw two guys pass by, and was horrified. Understandably, they were equally as amazing buy this huge thing, but then they promptly started … poking it!! Ew. 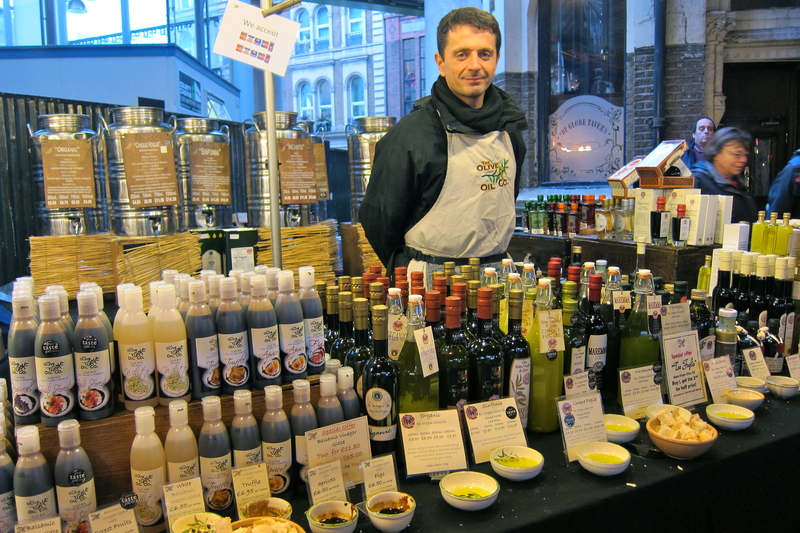 Make sure to visit the Olive Oil Company, where they sell a wonderful selection olive oil and vinegar, sourced from specialist producers across Italy. This was a truly wonderful source of all kinds of olive oil. The owner welcomes you to try as many of the oils as you want, and provides you with lots of nice, crusty bread to do so. The tastes transport you immediately to Italy in your mind! I purchased one bottle of Incanto, a lighter and more fruity olive oil, whilst my brother prefered the Maremma, with a stronger tasting and more peppery flavour. 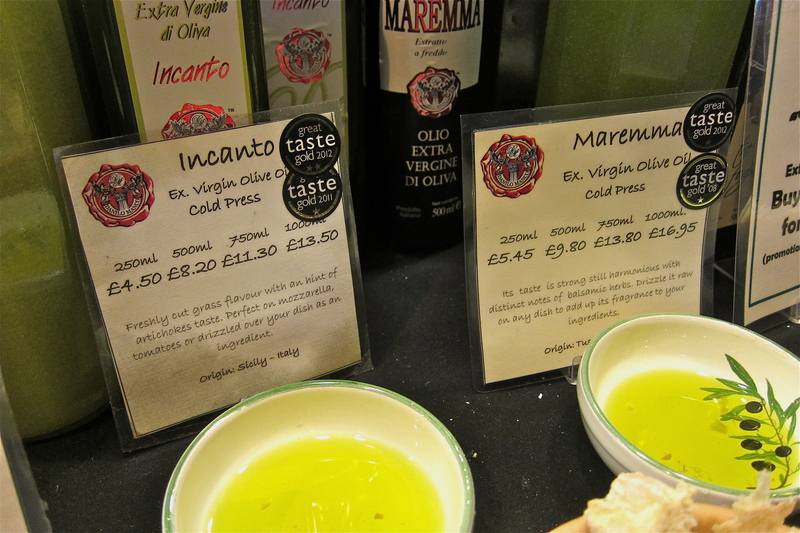 At £11.30 and £13.80 for 700ml respectively, price-wise they were not far off the generic olive oils you can buy here in Park ‘n Shop! I wish I could have bought so much more! 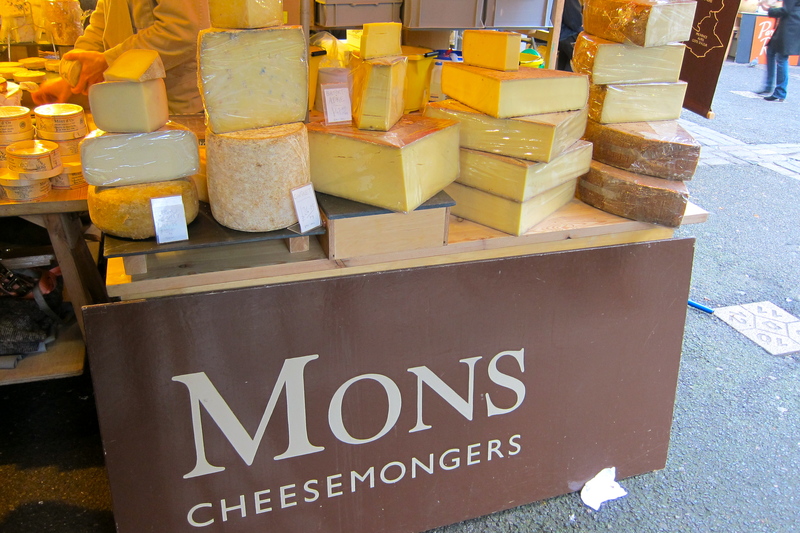 There are several cheesemongers, but the moment I saw Mons, I made a beeline for it. I recognised it immediately as the producer of the cheese that we buy regularly from GrEAT! They make some really lovely cheeses. 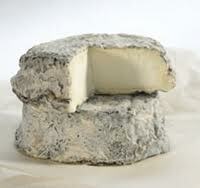 Our favorite is the selles sur cher, a creamy goats cheese with a crust of black ash, not too strongly flavoured yet still packs a punch. They sell it at grEAT for about HK$ 120, which is not far off the price that they sold it for at Borough Market. Even though I wasn’t able to buy any of them, I was happy to walk away knowing that even though the cheeses at grEAT are expensive, they are not marking them up by a huge amount. The market is split into two main sections, the Jubilee Market and the Green Market, as well as other vendors scattered around them. 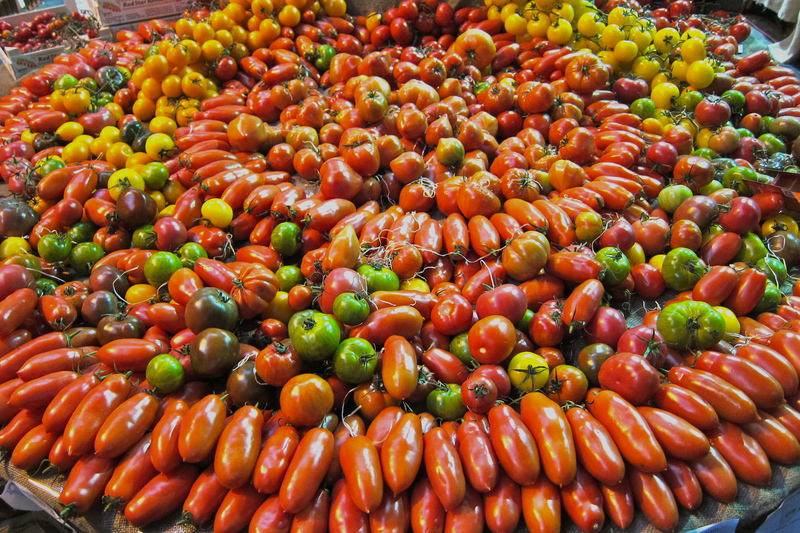 The Jubilee Market is where most of the fresh food and artisan stalls are located, whilst the Green Market is mostly fresh produce. Feeling fully satiated from the raclette, sandwich, hot dog, mulled wine, cheese and olive oil tastings (!! ), we went to check it out and to walk around to make some room for dessert. I wanted to try them all! 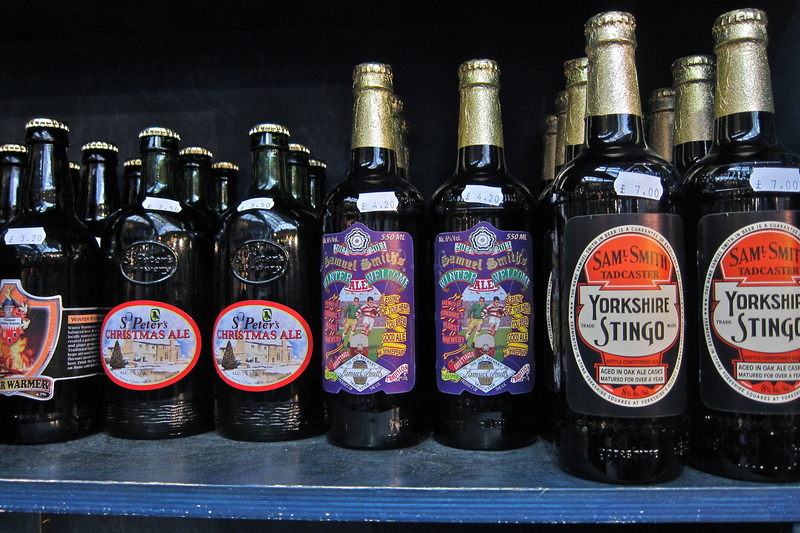 Head to Bourough Wines to see an amazing array of artisan beers and ciders. 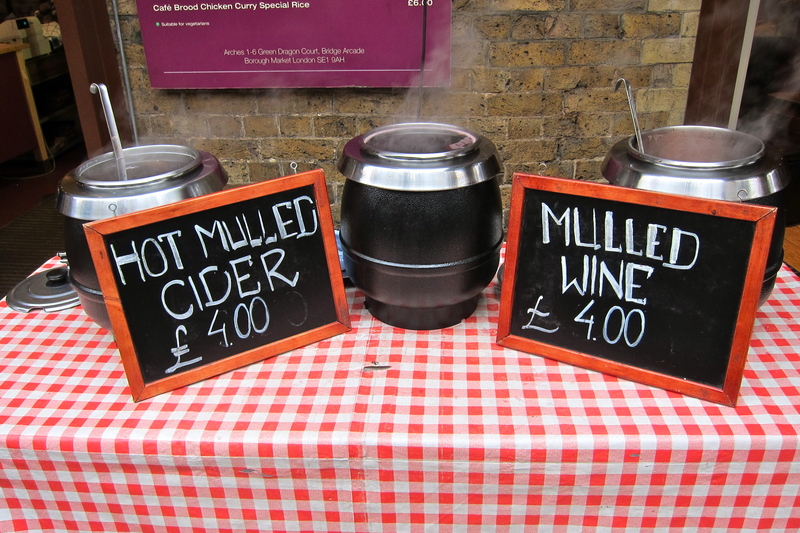 After scouring the website, I’ve noticed that Borough Markets have teamed up with Celia Brooks to offer 3 hours food and wine tasting tours on Fridays until the 26th April. Celia Brooks is an American vegetarian chef who was once Stanley Kubrick’s private chef. Boys, she’s also a bit of a looker, so if you take the tour, you guys might acquire a new appreciation for culinary pleasures! It’s a bit steep at GBP 70 (HK$ 860) per person, but you can taste a whole bunch of the foods, (including the fine cheeses, Turkish delights and rare breed meats below). If I were there for longer, I might have tried it – if anyone has, please feel free to share your thoughts on the tour! 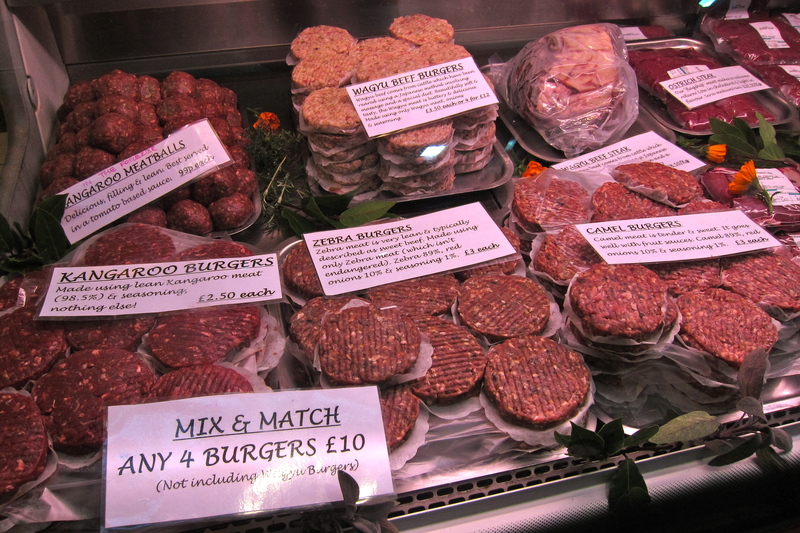 Vist the website (http://www.boroughmarket.org.uk/) to see what’s going on at the market (there is so very much!). Cooking demonstrations, cheese evenings, Christmas events – this is just what’s flashing across my screen now, but I’m sure they have different things happening all the time, and next time I’ll be more prepared to coincide my next trip with one of them! Check the webiste also for the various opening times, I’m glad I did because I was originally going to go on a Sunday, andwhile some of the restaurants are open, all of the stalls are closed on Sundays. 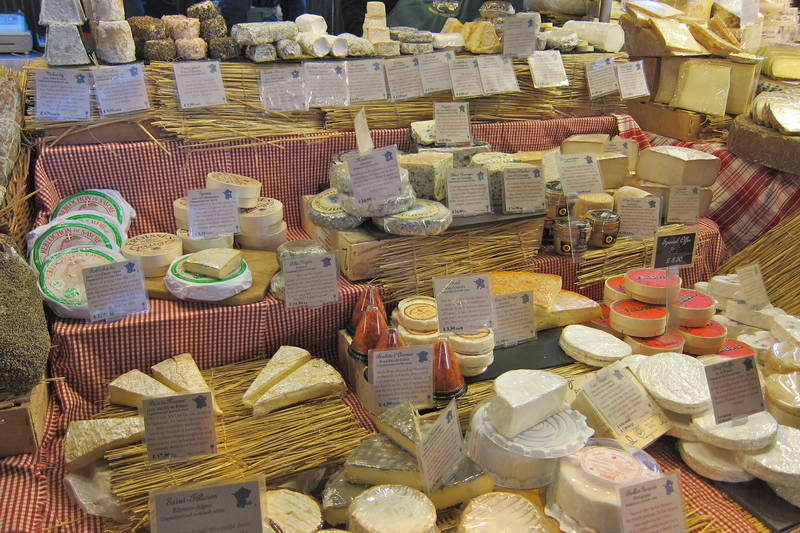 Posted in Eating the World - London, Travel Destinations & Hotels I Love	| Tagged Borough Market, Borough Wines, Bread Ahead Bakery, brebis cheese, Celia Brooks market tour, dried mushrooms, Green Market, Haloumi and bacon sandwich, Incanto olive oil, Jubille Market, London, London Bridge Tube station, Maremma Olive Oil, Mons Cheesemonger, Mulled cider, raclette, saucisson sec, Sausage World. 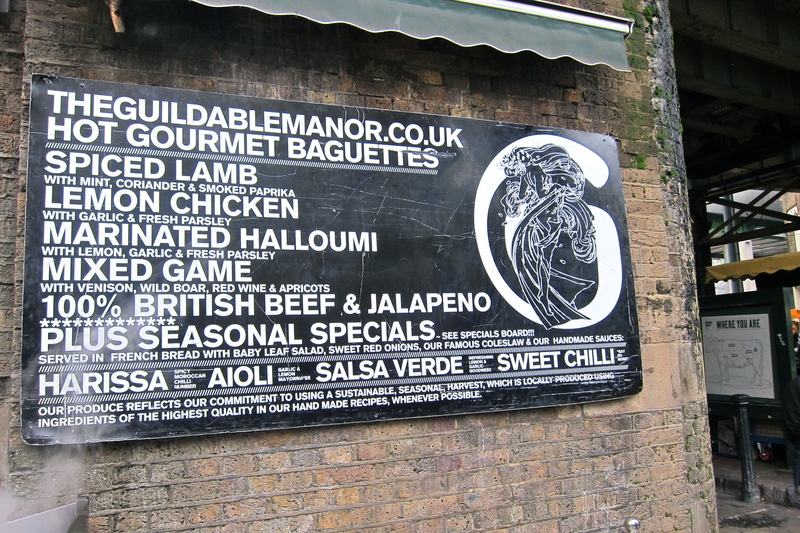 Une Normande a Londres, Selle sur Cher, The Guildable Manor, The Olive Oil Co. I don’t even understand how I ended up right here, but I believed this post used to be great. I don’t recognize who you might be however certainly you are going to a well-known blogger in the event you aren’t already. Cheers!